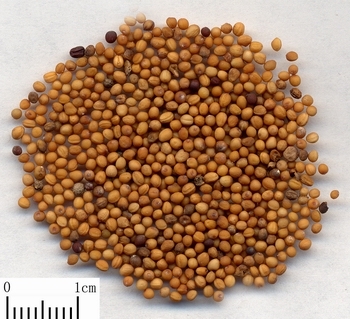 The dry ripe seed of annual or over annual herbaceous plant Sinapis alba L. or Brassica juncea (L.) Czern. et Coss. of family Cruciferae. Anhui, Henan and Sichuan provinces in China. Collected in the end of summer and beginning of autumn when the fruit ripened. Warm lung and dispel phlegm, promote qi flow and dissipate nodulation, resolve swelling and alleviate pain. This herb can dispel cold of lung, promote qi flow and resolve cold-phlegm. For cough, dyspnea and profuse and clear expectoration caused by cold-phlegm accumulation of lung and unsmooth qi flow, it is usually combined with qi-descending and phlegm-resolving herbs and antasthmatics. For instance it is combined with Su Zi and Lai Fu Zi in San Zi Yang Qin Tang from Han Shi Yi Tong (Han's Experience Collection). For cough, dyspnea, chest fullness and hvpochondriac pain as well as strong body structure and abundant qi, it is combined with phlegm-eliminating and accumulated water-driven herbs such as Gan Sui and Da Ji. For clod-wheezing, it is combined with Xi Xin, Gan Sui and She Xiang and made powder applied on the acupoint of Feishu (B13)and Gaohuang (B43) and so on. This herb is capable of warming and dredging meridians and collaterals, resolving swelling, dissipating nodulation and alleviating pain. It is also ground into powder singly and mixed with vinegar for external application it can warm and dredges meridians and vessels, eliminate phlegm and dispel cold indicated for deep rooted carbuncle of yin type and multiple abscess caused by damp-phlegm obstruction of meridians and collaterals. It is usually combined with blood-activating and meridian-dredging herbs and flow of qi-promoting analgesics to enhance the action when treating body numbness and swelling and pain of joint caused by phlegm and damp accumulation and obstruction of meridians and collaterals. For instance it is combined with Mu Bie Zi, Mo Yao, Rou Gui and Mu Xiang and made powder taken with wine in Bai Jie Zi San from Fu Ren Da Quan Liang Fang. It is commonly combined with yang-warming, cold-dispelling and blood-nourishing herbs. For instance in order to warm yang, remove stagnation, resolve phlegm and dissipate nodulation, it is combined with Lu Jiao Jiao, Rou Gui, Pao Jiang and Shu Di in Yang He Tang from Wai Ke Quan Sheng Ji (Life-Saving Manual of Diagnosis and Treatment of External Diseases). Decoct 3~6 g. Make powder; proper dose for external application. This herb has strong stimulation to the skin mucosa and will easily cause red and swollen and blister, so it is prohibited for those with digestive tract ulcer and bleeding, skin allergy as well. Do not use overdose.